The Babysitters’ Club was a book series for teen girls, written in late 80s and finishing in early 2000s. There are more than a hundred books in the series as well as spin off series. I loved reading the Babysitters’ Club books when I was younger and have been collecting them for a while now. I have about eighty books so far. I look for the books when I go to thrift stores and markets. They now reprinted the first four books, so some are available in department stores, but I like the old ones. I haven’t read all the books yet in the series. Dawn and the Surfer Ghost is a book no.12 in the mystery series spinoff. The books are standalone and feature one of the babysitters’ trying to solve a mystery. The mysteries are lightweight stuff like Scooby Doo mysteries as it is a book series for kids. There are seven babysitters in the series and the books focus on one of their viewpoints per book. This one is on Dawn Schafer, the environmental, vegetarian peace-loving babysitter. (There’s a different babysitter for every taste). Dawn has moved away from Connecticut where the other babysitters are, to live with her dad and her brother Jeff in California. She attends surf lessons with her friend Sunny and participates as a volunteer for children’s program at the beach. A big surfing competition comes up and Dawn enters it in the beginner’s category. One day, the best surfer on the beach goes missing. Some people think he’s dead others think he’s skipped town. Dawn is on the case to find the missing surfer. 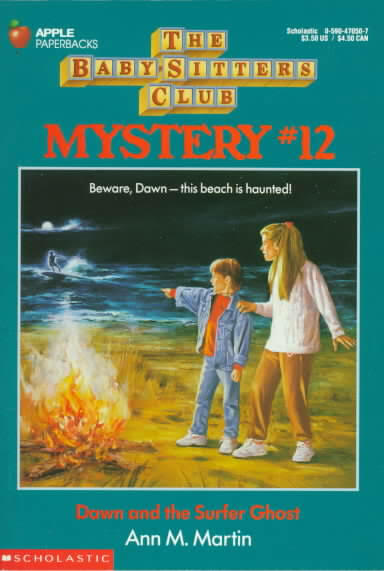 This mystery wasn’t as good as the other ones I have read in the series. I feel that she didn’t really do any sleuthing at all. There were hardly any clues, no following leads or false accusations, no mysterious calls telling her to quit investigating like the other mysteries. It all came together in the end when she got a hunch. What I enjoyed the most was the nostalgia from reading it. It is why I read the books. The book was printed in 1993. It was amusing how Dawn explains what a smoothie is and there’s lots of cringeworthy surfer lingo. I can picture this book as something from one of those made for tv movies when the characters go on vacation. I think my thirteen-year-old self would have liked this book and not noticed any of the shortcomings. 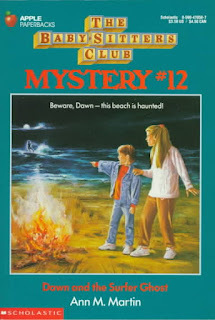 I don't remember reading these books but I'm sure I would have loved them, I'm a huge mystery fan, always have been. Even the light Scooby Doo ones.